The pictures in this post are of happy children in rural India. The first photograph is of children playing Holi. They accosted our car on a highway. It was all fun and games but when we approached them they realised we were not in a mood to play so they stepped aside. Not without spraying some colour on to our car though. Despite taking this picture through the windscreen the clarity is not bad. The second image is of a happy child riding a bullock cart with his father at the reins. In rural India bullock cart is a common means of family transport. Our car was right behind this bullock cart. The boy grinned and waved at us when he realised we were taking photographs. The people in rural India are very simple and do not mind when people take their photos. 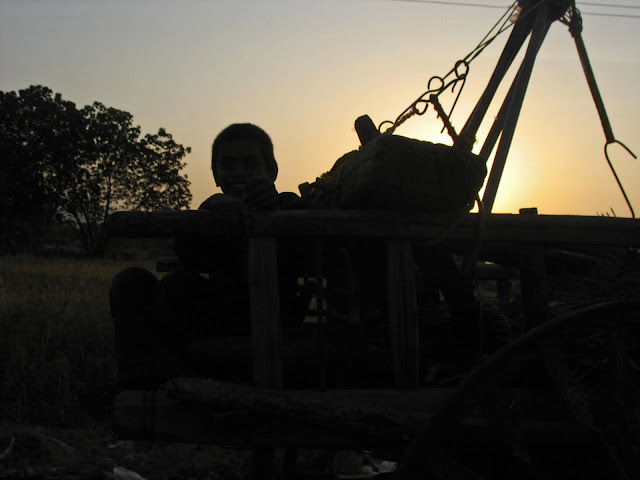 This silhouette is particularly interesting because of the way the bullock cart appears against the setting sun. Other related Images: School children from rural India or try the label "Rural India" if you are looking for more country images.